A mobile phone "virus" inside a pirated copy of a game called Mosquitos is roaming file-sharing and software download sites, say security experts. 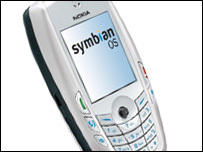 The game only works on certain phones running on Symbian OS Series 60. Once the illegally cracked game is installed a hidden program, called a Trojan, sends unauthorised SMS texts. It only affects pirated copies of the game; early reports said it texted premium rate numbers, but this is not the case, security experts have said. This comes months after the first mobile virus, Cabir, was created as a proof-of-concept. It was spread via Bluetooth and was harmless. The Mosquito Trojan is malicious because it fires off text messages without the user's consent while the unlicensed game is being played. But, confusingly, it has emerged that the Trojan was in fact not added by the group that pirated the game. "When we first saw this we were confused ourselves," Mikko Hypponen head of anti-virus research at F-Secure told BBC News Online. "We initially thought it was a game which had been hacked with a secret program that sent out text messages. But after analysing it, it seems to be an integral part of the game." The company that made the original legitimate Mosquito game, Ojom, said it had installed the program itself in earlier versions of the title after concerns over piracy. It was intended that the program secretly send a SMS message to alert them if an unlicensed copy was being used, according to Mr Hypponen. "It did not work the way it was supposed to; they had complaints and removed it from the game, " said Mr Hypponen. But the pirated versions of the game which are on file-sharing and free software sites are older ones. This means they still have that SMS functionality, said Mr Hypponen, which means text messages will still be sent, although not at premium rates. It is still classed as a "Trojan", he added. Mosquito's Trojan does not do any other damage and it is not widespread; it can be deleted easily, just like a normal game. The game will only be installed if users ignore two warnings that flash up on the screen. Sal Viveros, director of wireless security at McAfee told BBC News Online mobile users should make sure they download games from legitimate sites to avoid malware. He also urged mobile companies generally to provide more security for people to prevent malicious code getting onto phones. "These devices are getting more powerful memory and functions, and operating vendors are having more third party software applications with them," said Mr Viveros. "Once we are in the 3G world, we basically have a broadband connection, so phones will be closer to PCs in terms of functionality. "Having that connectivity historically leads to the spread of viruses." Japanese mobile giant NTT DoCoMo recently announced it was planning to provide protection for its customers. The mobile network has 46.6m subscribers. How do I protect myself from viruses online?